China's first space station, Tiangong-1, is expected to fall to Earth sometime in late 2017. We've known for several months that the orbital demise of the 8-metric ton space station was only a matter of time. 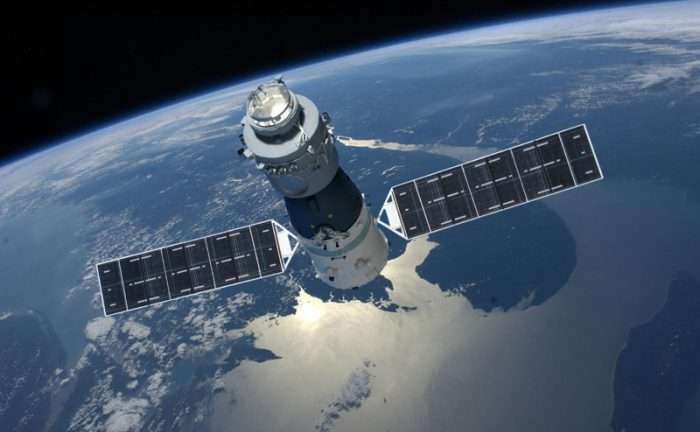 But Chinese space agency officials recently confirmed that they have lost telemetry with the space station and can no longer control its orbit. This means its re-entry through Earth's atmosphere will be uncontrolled. Despite sensational headlines this past week (and earlier this year) about Tiangong-1 exploding and raining down molten metal, the risk is quite low that people on Earth will be in danger. Any remaining debris that doesn't burn up in the atmosphere has a high chance of falling into an ocean, since two-thirds of Earth's surface is covered by water. While NASA and other space agencies say it's very hard to compute the overall risk to any individual, it's been estimated that the odds that you, personally, will be hit by a specific piece of debris are about 1 in several trillion. But numerically, the chance that one person anywhere in the world might be struck by a any piece of space debris comes out to a chance of 1-in-3,200, said Nick Johnson, chief scientist with NASA's Orbital Debris during a media teleconference in 2011 when the 6-ton UARS satellite was about to make an uncontrolled reentry. Wu Ping, deputy director of China's Manned Space Engineering (CMSE) office, said at a press conference before the launch of the Tiangong-2 space station last week (September 15, 2016) that based on their calculations and analysis, most parts of the space lab will burn up during its fall through the atmosphere. She added that China has always highly valued the management of space debris, and will continue to monitor Tiangong-1, and will release a forecast of its falling and report it internationally. So all that can be done now is to monitor its position over time to be able to predict when and where it might come down. 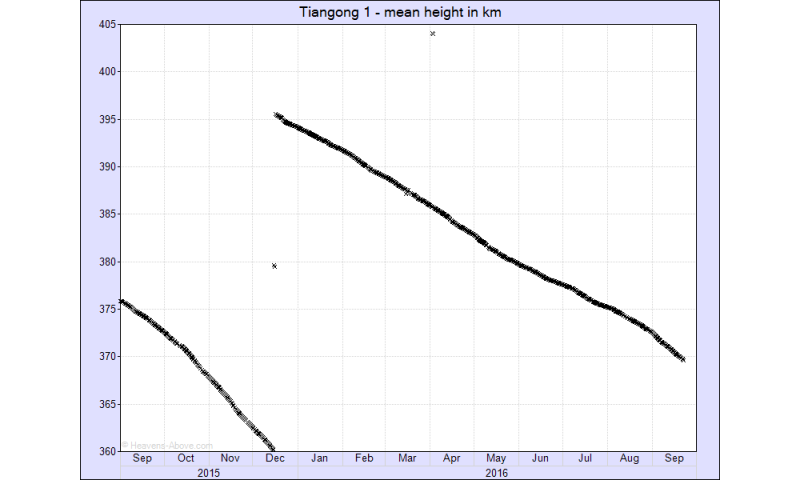 "Although Tiangong-1 is no longer functioning, keeping track of where it is not a problem," said Chris Peat, who developed and maintains Heavens-Above.com, a site that provides orbital information to help people observe and track satellites orbiting the Earth. "Like all other satellites, it is being tracked by the world-wide network of radar installations operated by the US Department of Defense," Peat explained via email to Universe Today. "They make the orbital elements available to the public via the Space-Track web site and this is where we get the orbital data from in order to make our predictions." "As it gets lower and enters the denser atmosphere, it will be subject to greater perturbations, but I do not expect Space-Track to lose it because it is so large," Peat said. "It will actually become brighter and easier to see as it gets lower." If you want to watch for it yourself, Heavens-Above provides tracking information anywhere around the world. Just input your specific location and click on "Tiangong-1," listed under "Satellites." Heavens-Above (they also have an app) is great for being able to see satellites like the International Space Station and Hubble, as well as seeing astronomical objects like planets and asteroids. Heavens-Above also has an interactive sky chart. "This is a notoriously difficult task," Peat said and even a day before re-entry, the estimated re-entry point will still be uncertain by many thousands of kilometers. The Russian Mir space station was brought down in a controlled manner using its propulsion system to re-enter over the South Pacific, but Tiangong-1 is no longer functioning so the re-entry point cannot be influenced by ground controllers." 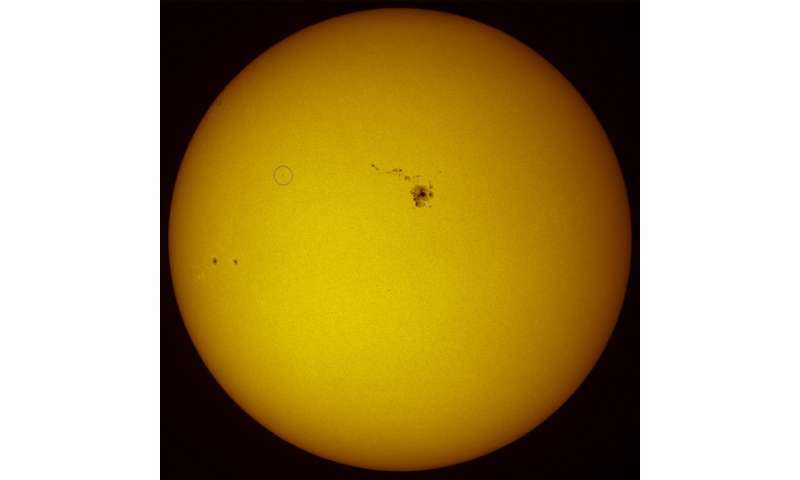 Jonathan McDowell, an astrophysicist at the Harvard-Smithsonian Center for Astrophysics who also monitors objects in orbit, said via Twitter that Tiangong-1's reentry could be anywhere between the latitudes of 43 degrees North and 43 degrees South, which is a rather large area on our planet and are the latitudes where a majority of Earth's population resides. That's not especially comforting, but remember, the odds are in your favor. 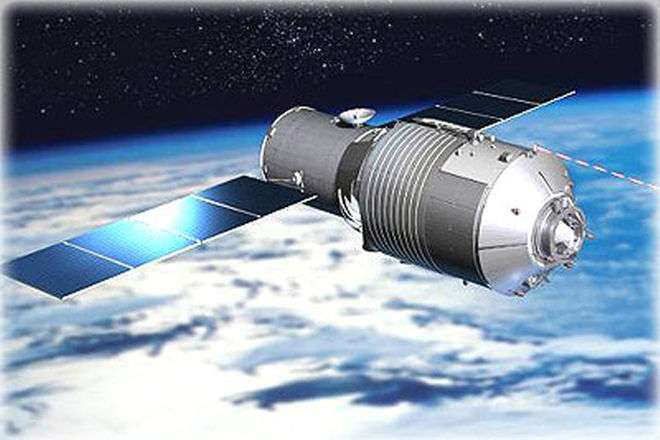 Tiangong-1 was launched in September 2011 and ended its functional life in March this year, when it had "comprehensively fulfilled its historical mission," Chinese officials said. It was operational for four and a half years, which is two and a half years longer than its designed life. 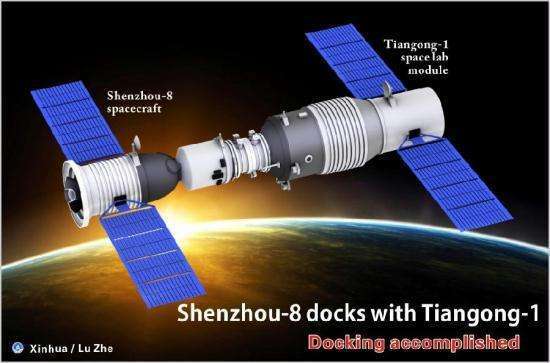 It was visited by the un-crewed Shenzhou-8 in 2011, and the crewed missions of Shenzhou-9 in 2012 and Shenzhou-10 in 2013. It also was used for Earth observation and studying the space environment, according to CMSE.